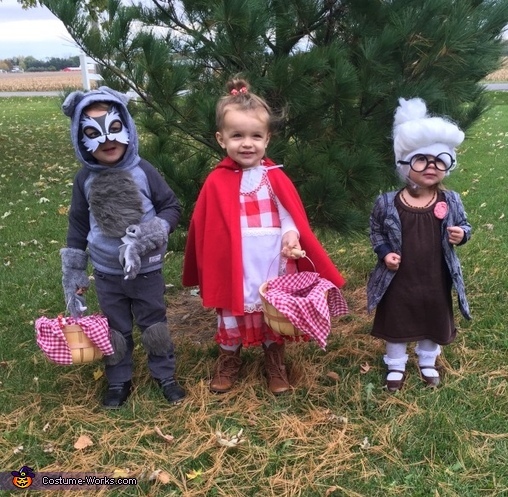 My daughter is wearing the Little Red Riding Hood Costume along with her two cousins wearing the Big Bad Wolf and Granny costumes. I came up with the idea of Little Red Riding Hood when I was shopping for my daughter and saw a clothing line that had hints of the story on the clothing. I immediately thought this would be a cute and easy idea. She already had the checkered dress and combat boots that I knew would be perfect for it. I bought some fleece fabric that I knew would be warm for the cape. I cut out a big circle and cut a slit up the middle. I then used one of the hoods of her coats to trace a hood on the fabric and cut it out and hot glued it to the cape. I bought a piece of white fabric for the apron and glued a piece of lace ribbon that I already had around the edges. My two sister in laws thought it would be fun for the other two kids to dress as they did and it was sure a hit when we went trick or treating.